We did this on November 9-10, 2006. Compounding the problem is that visiting every county in a place is even more complicated than that, since you can claim a visit the county by visiting ANY PART of the county, and there are thousands (or more!) of ways to visit a county. When you think about how many total roads there are in all of Ohio, you can see that even with computers, this is a difficult problem to solve. 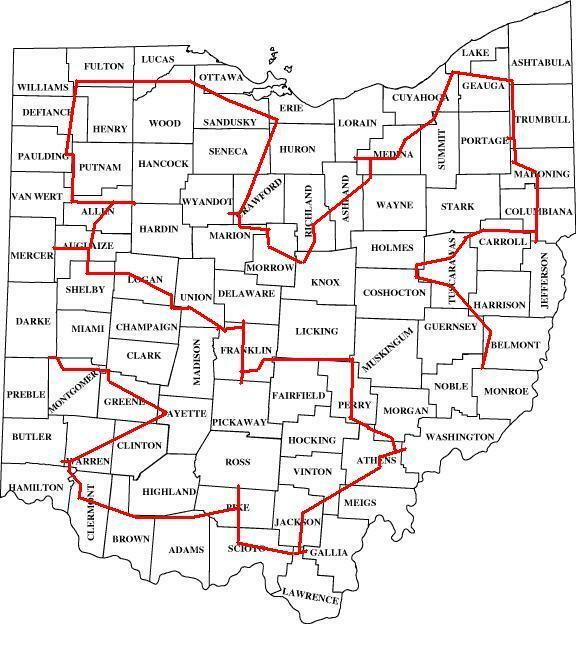 Visiting every county in Ohio: It’s GO time! After months if not years of planning, we gathered at the Columbus airport on the night of November 9, 2006. Since I live nearby, I had driven there, but we were picking up some out-of-town friends, as well as our rental car. We had booked an Economy car, but of course they didn’t have any of those, so they gave us a minivan. Not what we were hoping for, given the differences in gas mileage and the amount we planned on driving, but in the end, the extra room did make it a pretty good choice. Because there were no smartphones, I actually printed out our entire route, page by page, into 2 huge binders of maps that we brought with us, which proved hugely beneficial when a road we were scheduled to take in Morrow County proved closed by detour. We got pulled over by the police while heading through Columbus. When I tell people this, they often ask if we told the officer what we were doing. Uhhhh yeah I could see how that would go down. Uhhh Officer, we’re trying to set a land-speed record here, so if you could just speed things up… that would be great mmkay? The middle of the night – is this a road? Or someone’s driveway? That’s an actual Google StreetView picture of the road in question. Looks fine, right? Well, it quickly devolves into a dirt trail through the woods in the middle of the night. It was here that we first coined the term – “Is this a road? Or someone’s driveway?” We probably spent an hour trying to make sure we had crossed the border into Gallia County. After that fun adventure, the rest of the trip was pretty straightforward. We came in Cincinnati on OH-32, scooted around the northeastern suburbs, up I-71, cut through Xenia and Dayton and then finished our trip in Preble County, coming in at 23 hours, 34 minutes and 34 seconds. If you’re looking for more information, including in the van trip reports that we phoned in (remember, no smartphones in 2006), you can check the table of contents for the trip out on my old site – everywhatever.com. I don’t quite understand how you started in Columbus, based on that map. It seems like you’d have to start/finish in Monroe and finish/start in Preble. What am I missing? Holy crap, it’s been done! I’ve been thinking about doing something like this for some time (my vision would take me through all 88 county seats) but I loved reading that someone else has had a go at it. With the aide of today’s technology, how much time do you think stands to be shaven off your record if one were to go that route? I’m not sure that we’d be able to shave that much off the time. I think there is a lot of randomness involved in the trip. We had a lot of things go right, but also lost an hour or so driving around at 3am in the woods trying to find the Gallia County border. I think you’d see a lot of randomness in total times even if you drove this exact same route 100 times. One of the guys that was with me said he thought we would be >24 hours 9 times out of 10. I’m not that pessimistic but it’s certainly possible we’d not have made it.